General Al-Sisi, who took power as head of the armed forces after the military coup in Egypt on July 3, 2013, pays these days an official visit to Cyprus. Indeed, the organizations called on the EU to postpone the EU-Egypt Association Council scheduled for July so as not to give the Egyptian government the opportunity to present it as “… ratification of Egyptian policies in recent months by the EU and its member states “which would encourage President Al-Sisi’s government to take further, broader repressive measures … “. Last February, the Egyptian authorities invaded and closed the Nadeem Center, which had been rehabilitating victims of violence and torture in Cairo. The center had been documenting human rights abuses and treated torture victims. On 10 September 2017, Egyptian authorities arrested and detained Mr. Ibrahim Metwally, a prominent Egyptian human rights lawyer, at Cairo Airport when he was en route to Geneva where he was invited by the UN Working Group on Forced Disappearances. Canada, Germany, Italy, the Netherlands and the United Kingdom recently expressed in a joint statement their “deep concern over the detention conditions of Mr. Ibrahim Metwally” and demanded “transparency in prison conditions in Egypt, freedom of civil society and protection against torture”. 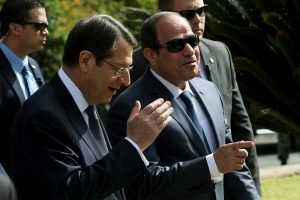 Unfortunately, the Cypriot government’s attitude towards General Al-Sisi not only undermines the joint effort of other European Union member states and the democratic efforts of the Egyptian people to restore democracy in Egypt, but according to statements by President Anastasiades, has publicly committed itself to helping to restore the image and the relationship of the Al-Sisi regime with the EU, despite the regime’s systematic human rights violations.